Running can lead to bonding with other runners and the community through which you run. Photo courtesy of Larry D. Moore. If the number of people running races is any indication, the act of running continues to grow in popularity in the U.S. According to the State of the Sport by Running USA, "Over the past 20 years, every year, except 2003, set a new high in the number of finishers in U.S. running events." In 2012, there were a record 15,534,000 race finishers and a record 26,370 running events in the U.S. alone." That's 5% of the U.S. population that finished a race, and the actual number of runners in the U.S. would far surpass this percentage, as not every runner competes in a race. Clearly, running is quite popular in the U.S., and with the continued surge in the sport that really gained mainstream acceptance in the 1960s there has been a subsequent rise of a running culture. Running culture can be observed in any number of places - from the neighborhood running store, many of which organize runs through local streets and parks, to one of the many races that occur throughout the towns and cities of both the rural and urban U.S. As a runner and anthropologist, I've been witness to many aspects of running that suggests there are social aspects of the sport that are rarely discussed, and even less frequently studied. Around running, then, there exists a social matrix that serves some purpose to runners and the communities in which those runners are embedded. At first glance, running may seem like an individualistic sport. You run on your own will and ability, you win a race or you don't, and there is nobody there to finish a race for you. However, talk with any number or runners who enjoy participating in their local 5k race or who belong to their local running club, and one commonality is sure to be the experience of bonding with other runners. This bonding occurs over a number of experiences, from striving to and reaching goals, to the finishing of a race, or to having a post-run drink. Running a certain distance, any distance, is an accomplishment that can be celebrated with others who have accomplished the same. It is this shared experience that drives bonding, and the social support derived through that bonding is one of the many factors that keep people running. But what of those who don't run with others, those who don't race, those that run the solitary path? There are many runners who never match pace with another. They prefer the meditative sounds of their own strides and the time and space to let their mind wander while running alone. And yet, there is another type of bonding that can take place with these runners: community bonding. As an avid solo-runner myself, I have experienced community bonding in multiple contexts, each sharing a thread that links me, the runner, with the community through which I am running. I offer three contexts wherein my solo running has bonded me with a local community. 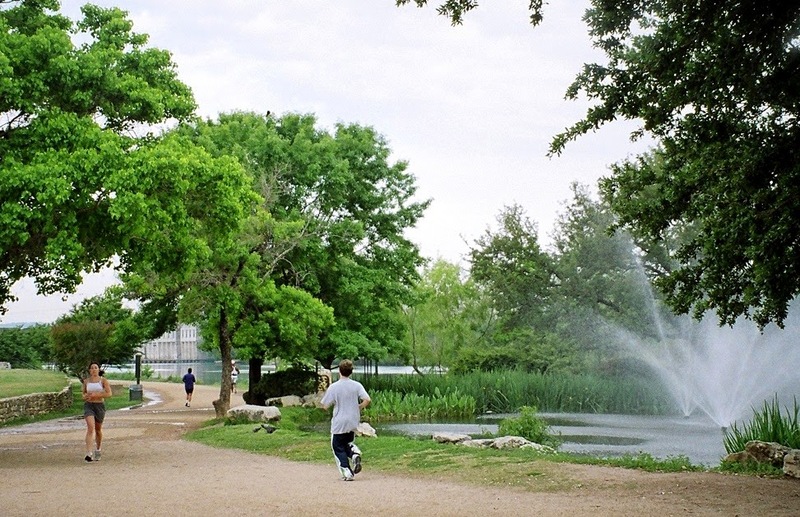 I began running in a small urban city in the southern U.S. that has miles of waterfront parks and trails. This recreational area is used by a variety of local people, including exercising mothers and fathers, people taking lunch breaks or out for an evening walk, volleyball players, kite flyers, cross fit trainers, and even homeless people. Over the course of weeks, then months, then years, I came to be a regular in one segment of this park, and I came to know the other regulars that also frequented the area. I made no good friends, but the smiles, nods, and hellos that I received every time I put on my running shoes made running - and my day - that much more enjoyable. I was often stopped by others to chat about running, or what I do, or to just say hello. I even received a Christmas card every year from one particularly interesting walker who fed and talked to the birds and squirrels. Through running, I experienced a bonding with a particular local community, one that makes use of the city park. In southern Belize, where I lived for nearly a year and a half, I also ran regularly. There, running was less common, but most people walked or rode their bikes to move around the small seaside town. At first, people often stared as I ran by, and children often laughed and mocked me. However, over time, people would recognize me, and in a similar experience, I began getting smiles, waves, and greetings. Soon people would stop me in town to ask about my running - why I did it, where I ran, and how far - and these visits often turned into conversations. Running turned out to be a way for me to bond with the community. By the end of my time there, a number of people were running along the sea front, in groups even, enjoying the physical and social benefits of the sport. As a final point of comparison, I recently moved to a fairly rural part of the northeastern U.S. Here, I run on the country roads, and it is here that I have received the most open hostility. I have had a large cup of soda dumped on and thrown at me from a passing vehicle, a person stopped their car and spit at me, and getting honked at is a normal occurrence. While I can't say for sure what drives this open hostility, I have come to suspect is for merely being on the road, which, in the minds of many more simple people, is the domain of cars and trucks only. Nonetheless, I am having a similar bonding experience with the local community. As I am seen more regularly by people in their yards, on their porch, or talking with neighbors, I am beginning to see those same smiles, nods, and hellos that I grew accustomed to elsewhere. What were at first looks of suspicion are now those of recognition. Again, my running through a community has allowed me, in some way, to bond with that community. Running is not commonly studied by anthropologists, and the concept of running culture barely exists. However, because the concept is new does not mean that the thing itself does not exist. I see one of the driving forces of running culture as the bonding that runners experience. Most evident is the bonding with other runners over the shared experience and feelings of accomplishment. However, there is another bonding - a community bonding - that also takes place if one runs in the same locale over time. Running through a community repeatedly over time allows for a bonding to take place between the runner and that community. And while the depth of that bond may vary from runner to runner and community to community, there are no limits to how deep those bonds can become.